ARHS Gymnasts must be flying high. They joined Algonquin’s list of 2019 League Champions. On Saturday, the team earned the Mid-Wach League Championship title. Now the team will focus on preparing for the sectional tournament they’re hosting on February 23. 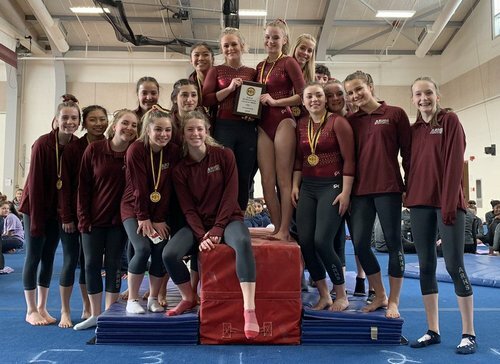 The host Tomahawks took first place in all four events, as Bryn Coghlin took first place in uneven bars (8.9) and balance beam (9.2), Sarah Middleton claimed the floor exercise (9.25), and Tessa McAndrews won the vault, as the Tomahawks posted a team score of 145.8. . .
Of the top 12 finishers in the four events, Algonquin claimed nine of those spots, and will look to carry its momentum into the South Sectional Championship. . . The T-Hawk Gymnasts will hope to do well enough at Sectionals to still be in it when they host States in March. The state tourney will take place this Friday at the Reggie Lewis Center. They aren’t the only State bound athletes out of the school. As a team, Gonk Wrestling only ranked 6th out of 13 at the MIAA D2 Central Sectional Tournament. But five of their wrestlers qualified to compete at this Friday’s D2 State Tournament with hopes to continue to All States. Two of those are Sectional Champs for their weight classes, Shea Garand and Andrew Goddard. Garand’s title win followed another accomplishment on the mats that day – his 100th career win. Also heading to States are Tim Goddard (2nd place) and Andre Hird and John Fontecchio (with 4th place wins). For more videos, check out their twitter feed. It looks like several members from each team qualified to compete at States this weekend. You can find the psych sheets here. *The ARHS Athletics schedule omitted the state tournament for Wrestling and listed Girls Track as on Sunday. I edited the schedule based on the tournament information posted to the MIAA website. Updated (2/14/19 11:50 am): The State Tournament information for swimming was posted, so I inserted it above. The school website did fix the listing for the Girls Indoor Track tournament to be the same as I listed above. It still isn’t showing Wrestling, but the posted brackets confirm that team members will be competing on Friday.